1. Heat up a pan on medium heat, grease it slightly with olive oil, pan-fried the French bread until both sides become golden brown. Use the peeled garlic to rub against the fried French bread. Set aside. 2. Add some olive oil to the pan on medium heat, pan-fry both sides of the tomato for a while, sprinkle with some salt & black pepper on top. Remove and set aside. 3. Continue with frying the eggplant, same method as per step 2. 4. 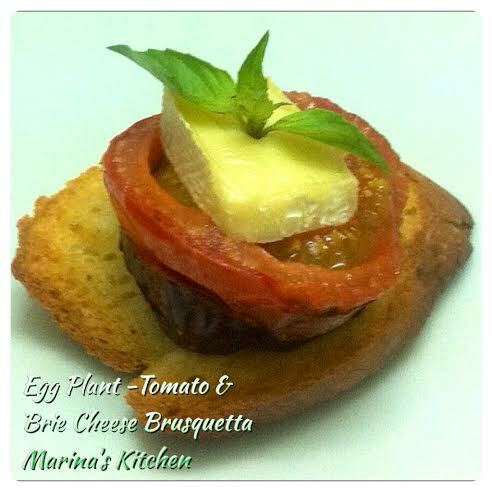 Stack 2 pieces of fried eggplant together, top with a piece of fried tomato, with a piece of brie cheese on top. Repeat for the rest. Cover with lid on low heat until the cheese melt. Remove and top it on the French bread prepared in step 1, garnish with basil and serve.